Excessive speed was a factor in a car crash Wednesday night on Maroon Creek Road near the T-Lazy 7 Ranch that injured five area high school students, according to the Colorado State Patrol. An 18-year-old Aspen man at the wheel of the northbound 2017 Tesla X swerved for unknown reasons and the car went off the right side of the road, became airborne, hit a large tree and rolled into Maroon Creek, Trooper Gary Cutler, a CSP spokesman, said Thursday. CSP received a call about the accident at 7:55 p.m., he said. Another 18-year-old female passenger suffered moderate injuries, while a 17-year-old male was seriously injured and an 18-year-old man escaped with minor injuries. All were taken to AVH, Cutler said. One may have later been flown to a Denver hospital, though that could not be confirmed Thursday. 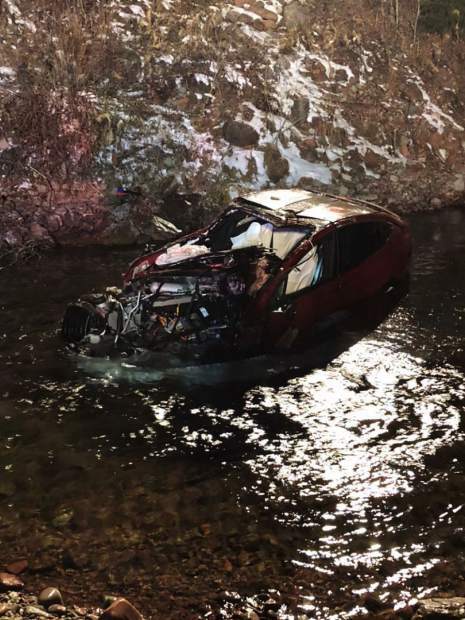 A T-Lazy 7 Ranch resident, who was one of the first people on the scene, said it appeared the teens missed a curve, flew off the road, rolled down a 20-foot embankment and into Maroon Creek. Jesse Deane, 27, said his father called him Wednesday evening and told him a car was in the river and people needed assistance. When he reached the car, he said he found a man and woman still inside, though neither appeared seriously injured. Both were conscious and responsive and were not trapped, he said. Three others who were in the car were on the road at the time and also did not appear seriously injured, Deane said. The car may have flown as much as 100 feet into the air and down the embankment into the river, he said. Police and paramedics arrived about the same time as Deane, who helped them carry the girl out of the car. Alex Burchetta, operations director for the Pitkin County Sheriff’s Office, said all the occupants of the car were area high school students. The father of one of the passengers, who was at the crash scene Thursday afternoon, said the car had been traveling 75 to 100 mph when it left the road. The car then hit the tree and broke into three pieces before settling in a shallow part of the river, he said. If the water was any deeper, drowning could have been a factor, he said. James Gordon, the city of Aspen’s hydroelectric operator who was at the crash scene Thursday afternoon, also said the passengers were lucky. Cutler did not have any information about whether State Patrol will charge the driver in connection with the crash.